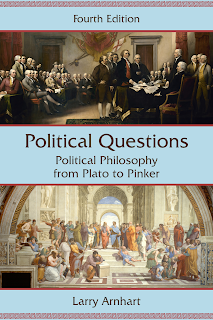 Here is the book cover for the fourth edition of Political Questions, with the two paintings reproduced on the cover. I thought a lot about what the cover of my new book should look like before I settled on this design, with John Trumbull's "Declaration of Independence" at the top and Raphael's "School of Athens" at the bottom. Trumbull's painting was commissioned by the United States Congress in 1817, and it was placed in the U.S. Capitol Rotunda in 1826, where it remains today. The painting shows the presentation of the draft of the Declaration of Independence to the Second Continental Congress at Independence Hall on June 28, 1776. It shows 42 of the 56 signers of the Declaration. Trumbull decided not to paint those for whom he had no likenesses. 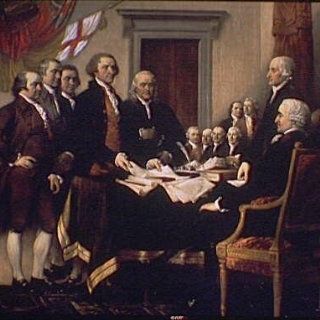 At the center of the painting is the five-man drafting committee--John Adams, Roger Sherman, Robert Livingston, Thomas Jefferson, and John Adams--with Jefferson standing out from the group as the one presenting the draft, and thus suggesting his primary influence in the writing of the document. Raphael's "School of Athens" fresco was painted early in the sixteenth century for one of the walls of the library for Pope Julius II in the Apostolic Palace in Vatican City. The ancient philosophers are painted with Plato and Aristotle at the center, who are turning their heads to look at one another. 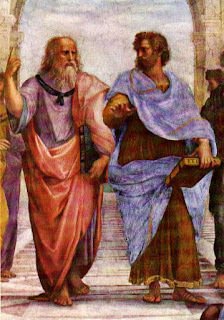 Plato points upward with the index finger of his right hand, while holding upright in his left hand a copy of the Timaeus. Aristotle gestures forward and downward with his open right hand, while holding flat in his left hand a copy of the Nicomachean Ethics. On the one hand, this suggests a contrast between the vertical perspective of Plato and the horizontal perspective of Aristotle, as though Plato were saying "It's up there," and Aristotle were saying, "No, it's down here amongst us." On the other hand, the symmetrical design of the painting suggests that the Platonic and Aristotelian perspectives complement one another. A few years ago, I wrote a long post on Raphael's painting as part of his Stanza della Segnatura. I decided that putting these two paintings on the cover of my book would point to some of the recurring questions raised in the book. Raphael's painting raises questions about the relationship between Platonic cosmic transcendence and Aristotelian empirical naturalism. Juxtaposing it with Trumbull's painting raises questions about whether the Declaration of Independence points to some of the issues debated by philosophers, which is one of the themes of my book. Many readers of the Declaration of Independence have seen echoes of John Locke and Lockean liberalism. Others have seen other philosophical influences (such as the Scottish Enlightenment). Jefferson himself pointed not only to Locke but also to Aristotle, Cicero, and Algernon Sidney as authors whose ideas might be implicit in the Declaration. Some scholars, however, have argued that it's a mistake to see the Declaration of Independence as a statement of deep philosophical principles because it actually had only one limited purpose--declaring and justifying American Independence from Great Britain. The elevation of the Declaration to an almost sacred document stating the philosophical principles of American political life was the work of Abraham Lincoln and others. 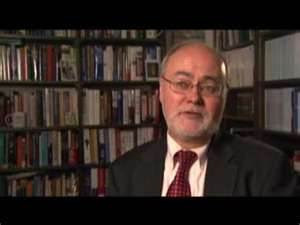 The scholars arguing this position include Pauline Maier and Barry Alan Shain. I am inclined to agree with Michael Zuckert and others who argue that the Declaration really does evoke the philosophic principles that Jefferson attributed to it. In any case, I hope that the cover of my book suggests such questions about the connection between political philosophy and political practice. As soon as the book is available, I'll post an announcement.